Vic Falls Safari Lodge is without doubt one of the most popular places to stay in Victoria Falls, Zimbabwe. The Lodge is situated on a high plateau overlooking the vastness of the Zambezi National Park, giving you the superb feeling of being out in the remote African wilderness, yet a short 15 minute drive takes you into the town centre and the Victoria Falls Rainforest entrance. The central lodge area which encompasses the Reception, the gift shop, the Buffalo Bar, the MaKuwa Kuwa restaurant and various lounges underwent a complete facelift in 2012, and the rooms in mid 2014, bringing the lodge up to truly international standards. 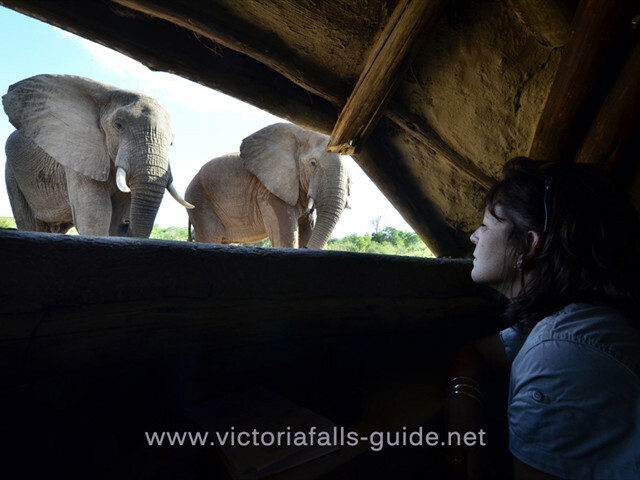 All the bedrooms at Victoria Falls Safari Lodge are en-suite and the sliding glass doors open onto balconies with uninterrupted views of the National park, some rooms overlooking the waterhole. The rooms all have soft natural fabrics and brightly coloured African paintings giving them a wonderful contemporary safari lodge feeling. There is a complimentary bus shuttle available every hour from the Lodge to designated points in town starting at 07h45 with the last bus leaving at 21h45. 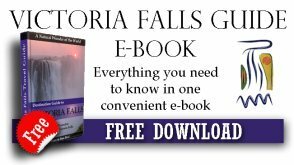 Victoria Falls Safari Lodge has high and low season rates, please contact us for these rates (High 1st July to 31st Dec) and (Low 1st Jan to 30th June). 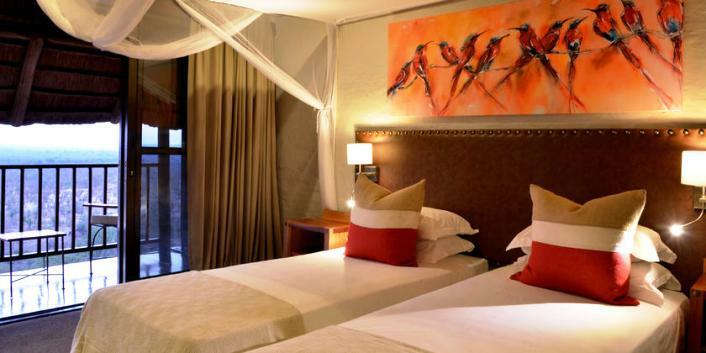 Victoria Falls Safari Lodge is a top of the range hotel and is therefore amongst the highest priced hotels in town but it is well worth it and you wont be disappointed. Probably one of the most popular hotels in Vic Falls and for good reason. It has a unique location overlooking a waterhole well frequented by wildlife. Sunsets from the Buffalo bar viewing deck are a must do activity even for people not staying there. The bedrooms all have great views, some of them overlooking the waterhole. The service and food is excellent in fact everything about this Lodge is fantastic and we highly recommend it in this price range of luxury hotels. 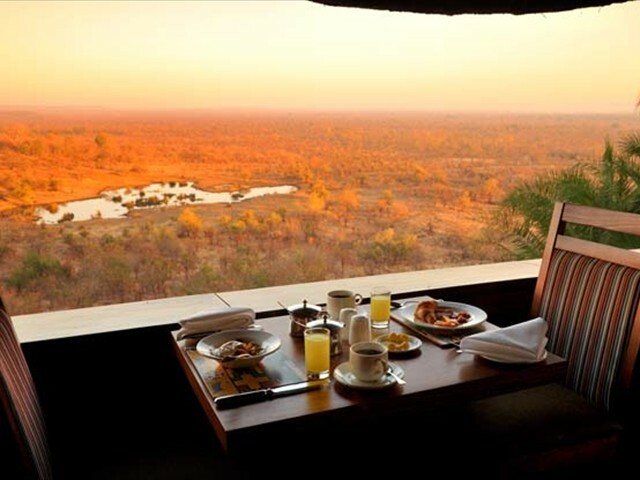 • MaKuwa Kuwa Restaurant – a la carte – situated overlooking the waterhole (floodlit in the evening) on the open balcony. Internationally styled cuisine, with a hint of African and game dishes thrown in. • The Boma – “The Place of Eating” – Set in the nearby Gusu Forest, just 500 metres from the Safari Lodge. The Boma offers a unique African experience including traditional dancers and mouth watering local dishes. Highly recommended !! Both restaurants have received major accolades at the recent 'Zimbabwe on a Plate' annual national restaurant awards. 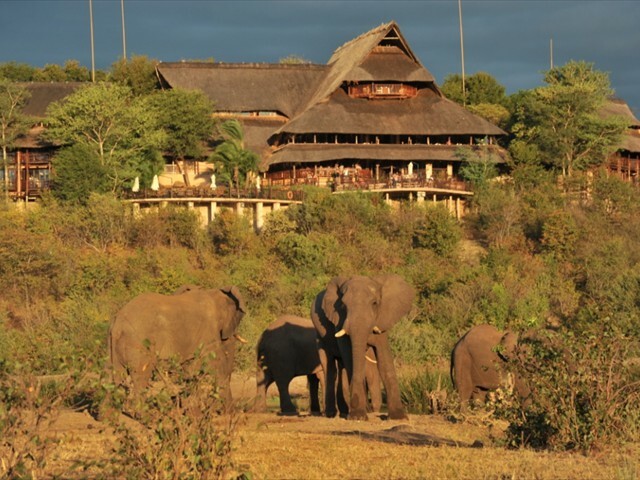 • Buffalo Bar - An open plan bar with its own game-viewing platform overlooking the waterhole. Click on the link to read more about the conference facilities at Victoria Falls Safari Lodge.